A French architect claims to have solved the mystery of how Egypt’s Great Pyramid was built. 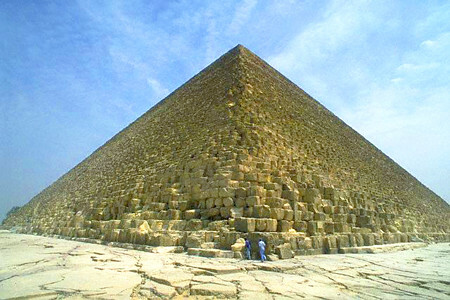 Jean-Pierre Houdin said the 4,500-year-old pyramid, just outside Cairo, was built using an inner ramp to lift the massive stones into place. Other theories contend that the three million stones – each 2.5 tons – were pushed into place using external ramps. Mr Houdin studied the problem for eight years and used a computer model to illustrate how he thought it was done. “This is better than the other theories, because it is the only theory that works,” said Mr Houdin as he unveiled his theory with a 3D computer simulation. He believes workers used an outer ramp to build the first 43 metres (47 yards) then constructed an inner ramp to carry stones to the apex of the 137m pyramid. The pyramid was built to house the tomb of Pharaoh Khufu, also known as Cheops. The Grand Gallery inside the pyramid, another source of mystery for Egyptologists, housed a giant counter-weight used to hoist five 60 ton granite beams into position above the King’s Chamber. Mr Houdin said that an outer ramp all the way to the top of the pyramid would have blocked sight lines and left little room to work, while a long, frontal ramp would have used up too much stone. Further confusing matters, there is little evidence left of external ramps at the site of the Great Pyramid. Mr Houdin said the pyramid could have been built by 4,000 people using his technique instead of 100,000, as postulated by other theorists. The architect is now assembling a team to verify his theory on site using radars and other non-invasive means.